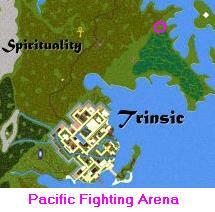 The Pacific Fighting Arena is open on Friday Evenings at 9:00 PM Pacific Standard Time. Since the Arena is on the roof of a tower, the judges all have the ability to ban anyone attempting to disrupt the proceedings. This seems to be a slight advantage over other fighting pens and arenas.